The Chorus was founded in 1983 under the sponsorship of the Sperry Corporation and was called the SperryAires. It's very first public performance was at the dedication of the Eagan Public Library. Since then The Chorus has presented nearly 750 concerts to community, church, and senior functions not including performing at uncounted corporate events. After several corporate mergers left The Chorus without a sponsor, the City of Eagan in 1999 generously welcomed it to the community. 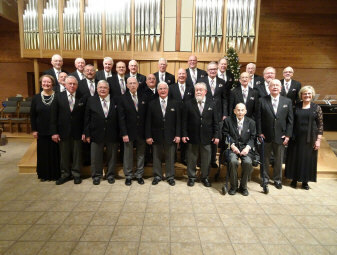 Under the sponsorship of The Parks and Recreation Department the Eagan Men's Chorus was able to continue fulfilling it's goal of bringing the joys of music to the community. The Eagan Men's Chorus' wide repertoire includes Gospel, Pop & Show tunes, Patriotic, Spirituals and the Classics. The Chorus' huge sheet music library includes favorite arrangements of the works of well known classic and contemporary composers. The Eagan Men's Chorus is a member of the Associated Male Choruses of America. The Chorus participates during the year in various joint events with other choruses throughout the Upper Midwest. This includes the Big Sing where over 300 voices unite for a weekend of song and fellowship. The Eagan Men's Chorus with Director Kathy Andrews and Accompanist Judy Campen at its Christmas concert at Mt Calvary Lutheran Church on December 6, 2017. Site questions or comments? Contact the Webmaster.